In his essay, “On Fairy-Stories,” J.R.R. Tolkien seeks to elucidate the nature and purpose of fantasy writing. As he explains, the intent of fantasy literature is not to spin idle tales of fanciful places but, rather, to cast distinctive light upon the known world: “For creative Fantasy is founded upon the hard recognition that things are so in the world as it appears under the sun; on a recognition of fact, but not a slavery to it.” Thus the fantasy writer’s talent is in the employ of reason. “The keener and the clearer is the reason,” adds Tolkien, “the better fantasy will it make.” And the better the fantasy, the fresher the perspective on our own affairs. In this way, fantasy facilitates a kind of “recovery” of our senses or, perhaps more accurately, our sense of the way things really are. 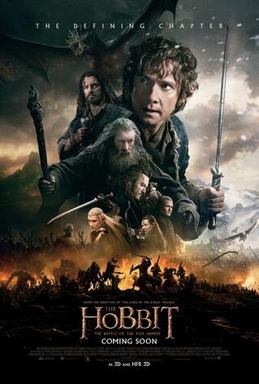 This purpose is brought to the forefront in Peter Jackson’s latest adaptation of Tolkien’s literary corpus — namely, The Battle of the Five Armies, the third and final film based on Tolkien’s 1937 children’s book, The Hobbit. In an exhilarating sequence, the movie begins with the dragon Smaug’s fiery attack on Laketown and its human inhabitants. Yet, when Smaug is slain by Bard the Bowman (Luke Evans), a social and political quagmire ensues. The dragon had left untold riches in Erebor — the great mountain he once stole from the Folk of Durin (dwarves) — and now various parties want a piece of the wealth. The dwarves, led by the brave yet troubled Thorin Oakenshield, hole up in their ancestral home, hoarding their inheritance. Meanwhile, the men demand payment for the killing of the beast, even as the wood elves arrive to claim what they see as rightful recompense for their aid. Both groups amass armies outside Erebor and contemplate a siege. And this is to say nothing of the orcs, whose chieftain, Azog the Defiler, is bent on destroying the dwarves and taking the spoils for himself. That war will ensue is all but inevitable. The question is: how will it proceed? Will the dwarves, now strengthened by reinforcements from the Iron Hills, forge an alliance against the orcs, who are counting on the fragmentation of their enemies? Or will they allow their former allies to perish as they watch from the belly of the mountain? This is, in effect, the entire plot of The Battle of the Five Armies, and it is exhausted in less than 90 minutes. Yet, with a running time exceeding 140 minutes, Jackson fills up the remaining time with an assortment of battle sequences, a number of which are too cute by half. Such was the cost of trying to squeeze three epic films from a children’s story. Nevertheless, the moral imperative of Tolkien’s story manages to shine through. So often social and political divisions crystallize over trivialities, pitting groups that otherwise have much in common against one another. What Tolkien suggests, however, is that these sorts of disputes are dangerous just to the extent that they blind us to the ultimate source of trouble: neither the dwarves nor the men nor the wood elves are aware of Azog’s army until it’s almost too late, and they are oblivious to Sauron’s growing power at Dol Guldur, which (Jackson loves to remind us) will eventually push all of Middle-earth into war. Of course, with the help of Gandalf, not to mention an ever-handy band of Great Eagles (the story’s fifth army, for those keeping score at home), tragedy is averted. But the larger point remains, even if time has rendered it more complicated. To be sure, in our age of 24-hour news coverage and seemingly bottomless digital information, it’s not so easy to distinguish elf from orc. (One can imagine a twenty-first century headline: “Azog the Defiler: Why He Fights, Plus His Top-Five Tips for a Fabulous Beach Body!”) Indeed, as Kierkegaard predicted in A Literary Review (1846), it’s even morbidly satisfying to argue over trifles rather than confront what’s truly wrong, not only with ourselves, but with the world — a point that echoes Tolkien’s message in The Hobbit. Yet, whereas Tolkien uses the Eagles as a kind of deus ex machina — a “eucatastrophic” move that, in his view, is essential to fantasy writing — Kierkegaard warns that there are no easy answers here. For him, salvation will not come in conquest but in suffering. For the great evil of our age lies in our failure to perceive that (or what) we are losing.